Recently, the military has conducted preliminary debriefing on 5 years of implementing the Central Military Commission’s Resolution 623-NQ/QUTW on “Military logistics work to 2020 and the following years”, drawing many invaluable lessons in this field. These lessons are fundamentals for pushing ahead the Resolution and improving the quality of logistical work to fulfill the task of building the military, strengthening national defense and safeguarding the country in the new era. To meet new challenging demands of national defense, on October 29, 2012, the Central Military Commission issued Resolution 623-NQ/QUTW on “Military logistics work until 2020 and the following years”. After the Resolution was announced, with a highly responsible and proactive spirit, our military adopted many effective and systematic approaches to realize it and achieved a lot of positive results. Basing on guidelines, objectives and principles issued by the Central Military Commission, units in the military made action plans, developed practical methods and identified execution procedures appropriate to particularities of military activities, national defense, government budget, and their respective stationed areas. At the same time, all available resources were concentrated and fully utilized, and the key role of military logistics units was highly promoted in leading and counseling the realization of the resolution. After 5 years of implementing the resolution, despite a lot of difficulties, especially natural disasters, epidemic breakouts, and market price fluctuations, the military basically managed to fulfill all the pre-determined criteria, in which many requirements were met ahead of the schedule and with higher results than expected; thus making significant progresses in every aspect of logistics work. Moreover, the awareness and responsibility of Party committees, commanding officers and service members at all levels in this field were improved. In addition, military logistics system, structure and resources were gradually enhanced, reformed and standardized. Besides, strategic logistics planning and counseling were promoted and closely coordinated with the development of national defense strategy. Also, logistic resource distribution, especially in strategic areas, was bolstered and enhanced. Additionally, logistics material procurement and acquisition methods continued to be complemented and innovated. It should also be noted that there were many important breakthroughs in the quality of clothing, food, accommodation and healthcare services, subsistence production, petroleum supply and transportation. That said, these achievements greatly contributed to the enhancement of our military’s fighting capabilities and combat readiness; and became a crucial factor in building a revolutionary, standardized, elite and gradually modernized fighting force. However, there are still several downsides in the implementation of the Resolution, especially in organization for executing the task. Implementation approaches in some units were not practical and appropriate with the Resolution’s criteria; the realization of logistics plan in those units was also somewhat inflexible. Besides, in accordance with the Resolution’s objectives, logistics work in certain units was not as effective as expected. These drawbacks were clearly pointed out in the preliminary debriefing of the implementation of Resolution 623 in the 2013-2017 period. Military leadership and Party committees at all levels and the Logistics Branch have taken them seriously and proposed timely resolutions to address these issues. 1 - Enhance the leadership role of commanding staff and Party committees in logistics work. Military units, especially commanding officers, Party committees and logistics personnel of all levels must firmly grasp guidelines, objectives and principles identified in Central Military Commission’s Resolution 623; thus fully understand the importance of logistics work and promote the role and responsibility of units’ leadership in this field. The immediate task is urgently reviewing Resolution 623 execution plans and making necessary and feasible adjustments for the implementation of the task from 2018 to 2020 and later years. At the same time, military units must actively carry out methods that are practical appropriate to pre-determined tasks. To achieve high efficiency, units’ leadership must aim for comprehensive implementation of the Resolution; but they also need to set priority among their goals; promote socialized resources and uphold the key role of their Logistics branches and the overall strength of related contingents. Most importantly, the implementation of Resolution 623 must be integrated into the process of carrying out resolutions issued by Party congresses of all levels (2015 – 2020 tenure), and by Central Military Commission, especially Resolution 520-NQ/QUTW, Resolution 513-NQ/QUTW, Resolution 765-NQ/QUTW and movements such as Determination to Win and “Military Logistics Branch follows the words of Uncle Ho”. At the same time, units must regularly conduct inspection of logistics work in their subordinate contingents to quickly identify drawbacks and propose solutions to address those issues. Also, units’ leadership must pay attention to good examples in logistics activities and carry out plans to multiply them. Besides, administrative bodies under the direct authority of Ministry of National Defense, especially General Department of Logistics, must conduct field studies to be able to effectively advise Central Military Commission and Ministry of National Defense, and correctly instruct units of all levels in conducting logistics work both in short term and long term. 2- Push ahead plans to develop people’s logistics capacity and network, and ensure sustainable logistics supply in defense zones. Grounded in our Party’s principles in building all-people defense scenario and people’s logistics network, and Resolution 623’s guidelines; the military, especially Logistics Branch, must play a key role in conducting researches, developing plans and suggesting strategic forecasts to assist military supreme leadership in identifying guidelines and policies on building logistics capacity and network, especially in strategic defense and security zones. Most importantly, on-site logistics capacity building must be highly prioritized; and strategic, operational, and defense zone logistics bases must be constructed as an extensive, systematic and sustainable network, ensuring a close integration of on-site logistics and mobile logistics, in which on-site logistics facilities act as the core element of the whole network. In addition, logistics network building must rely on experience and achievements gained from the previous period. Besides, responsible bodies of General Department of Logistics, military regions, local military commands must conduct further field studies and closely coordinate with government institutions, industries and local authorities to realize the goal of integrating socio-economic objectives with logistics capacity building and the construction of provincial and district logistics networks. Also, defense zone logistics network planning must be specific, and available resources must be invested to gradually build essential infrastructure for logistics bases at all levels. Additionally, it is necessary to complement mechanisms and regulations for logistics practice and capacity building in defense zones; and develop guidelines for on-site resources mobilization for national defense missions. These mechanisms and guidelines will serve as basis for logistics operations both in peacetime and in conflict. 3- Further innovate logistics distribution methods, enhance the performance of military logistics work, and heavily focus on providing high living standard and healthcare service for military members. These are the highest priority identified in Resolution 623 by Central Military Commission. According to this, the military will not only focus on regular logistics work for combat readiness and for units which have special missions, sovereignty defense duties, or station in important areas, or selected as priority for modernization; but also must proactively develop plans and prepare resources and assets to ensure sufficient supply available for unexpected missions and situations. At the same time, the spirit of “diligence and frugality”, and “self-strengthening, self-sustaining” must be upheld; and methods which aim for improving the performance of regular logistics work must be systematically implemented to meet the demand of military capability building in the new era. Besides, Military Logistics Branch must continue to act as an advisory body in strategic logistics planning. Also, it must focus on institutionalizing and integrating logistics policy structures. Furthermore, Logistics bodies must place emphasis on innovating logistics distribution methods and appropriately assigning logistics task to units at all levels. In addition, they must enhance logistics management, inspection and monitor practices; and expand logistics procurement contract biddings but also have to ensure that these contracts must fit unique features of military field and market conditions. Basing on principles and objectives identified in Resolution 623 and General Department of Logistics’ Plan 979/KH-HC, the military must focus on key issues and weaknesses in logistics work. Most importantly, logistics capacity building and logistics services, especially daily living and healthcare services for military members, must be taken to a new level. At the same time, economic development and defense capability building must be further integrated; and subsistence production must continue to be sustainable, effective and in compliance with food safety standards. Also, with respect to upgrading preventive healthcare system, hospitals, clinics, operational and tactical supply depots; and purchasing new logistics equipment and assets, investments in these fields must be efficient and follow instructions issued by Ministry of National Defense. Beside, based on their assigned tasks, all military units must propose effective barracks and basic infrastructure construction plans of the intermediate term 2017-2020 and carry out these plans with highest quality possible (1). In this regard, the use of military-owned lands must be strictly monitored and ensure legitimacy. And last but not least, in implementing logistics work, all units must aim for high efficiency, avoid wastefulness, and determinedly combat corruption. 4- Seek to build a comprehensively strong Military Logistics Branch, capable of fulfilling all near term and long term tasks. In the coming years, the military will continue to reorganize and strengthen Logistics Branch under Structural Adjustment Program for Vietnam People’s Army 2016-2020. Therefore, military units at all levels must actively conduct structural reorganization for their logistics contingent; and under guidelines identified in 12th Central Party Committee’s Resolution 04-NQ/TW, push ahead education and training programs for logistics personnel to improve their political awareness and working skills. Also, they must develop necessary methods to address logistics management issues and logistic personnel insufficiency, especially in junior units. To that end, General Department of Logistics must continue to cooperate with military units to develop and train human resource for their logistics contingents. Besides, logistics training programs must be further innovated under guidelines introduced in Central Military Commission’s Resolution 765-NQ/QUTW; these programs must be practical, effective and focus on improving working skills for logistics personnel, and ensuring high logistics capability and mobility for unit of all levels under any combat situation. At the same time, reservist logistics unit building must also be taken seriously. In addition, General Department of Logistics’ academic and research bodies must actively study and develop logistics doctrine; increasingly apply information technology in logistics work; set logistics quota for new military equipment, and specialized units and missions. Besides, they must also carry out projects to address climate change impacts on logistics work; conduct socialization programs in certain logistic fields which are appropriate to the current condition of our military and country. 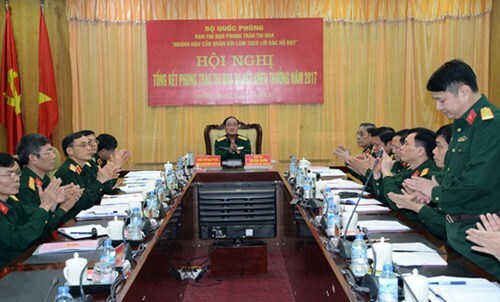 Additionally, in all military units, “Military Logistics Branch follows the words of Uncle Ho” movement must be implemented in conjunction with the Determination to Win movement and 12th Politburo’s Guideline 05-CT/TW on studying and following President Ho Chi Minh’s ideology, moral example and living style. This combination will surely provide great momentum to build a comprehensively strong Military Logistics Branch. Fully understanding the role of logistics work and firmly grasping objectives and guidelines issued by Central Military Commission, the military will strive to overcome any difficulty and effectively implement Resolution 623, creating significant progresses in logistics work, contributing to the improvement of our combat capability, the cause of building a “revolutionary, standardized, elite and gradually modernized” fighting force and the success of military and national defense tasks in the new era. 1- By 2020, barracks, depots and other infrastructure systems will be basically standardized, green, and clean; 100% of military facilities will have clean water, 85% of interior roads and grounds in military bases will be upgraded; renovation for low-voltage network will be 96% completed.